Join us to celebrate the completion of renovations to our Tasting Room, the Chapel and Atrium. 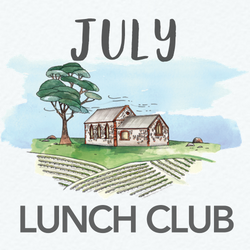 The Lunch Club is a joint initiative between Chapel Hill and The Food Business, our onsite hospitality team. Chef John Gabel has created a set menu using seasonal produce perfect for any occasion. Book for two or book for 20! Click through to your preferred date to book online or call Kate Sutherland from the Food Business on 0419 508463 to secure your place. A selection of Winter-warming tasting plates will be served in the heated Atrium for $40 per head – yummy inclusions such as marinated olives, almonds, pâté, charcuterie, house-made sourdough, duck puffs, meatballs, and arancini will be served. Once you have booked your date, a member of The Food Business team will be in touch to confirm your arrival time and any other requirements you may have.